Once artists find a formula for success, they often stick to it: if it isn’t broken, and all that. 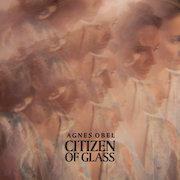 After two hugely successful albums – Philharmonics (2010) and Aventine (2013) – you might expect Agnes Obel to stay with what she knows, especially as she is famously superstitious. (Obel records in the same home studio, on the same chair, on the same pianos, singing into the same microphones so as not to tempt fate after earlier successes.) Her new album, Citizen of Glass, however, is markedly different from previous efforts, both conceptually and instrumentally. ‘A grip that will hold / So tight and close / Around my throat with / The weight of all our lives’, Obel sings on album opener ‘Stretch your Eyes’. Squealing cellos, tight strings and tip-toe percussion create Hitchcock-like tension throughout this enigmatic track. Seemingly exploring the suffocation brought about by being citizens of glass, the song is undercut with glass-like musical fragility in what feels like a warning: if we make ourselves too transparent, what is left? If we put ourselves under too much scrutiny, will we ultimately shatter? Songs ‘Familiar’ and ‘Mary’ take this a step further, containing protagonists who are indeed broken and exposed. “In my house the silence rang so loud / Under doorways, through the hallway down / Waiting for the secret to grow out / Oh what we do when no one is around,” Obel sings on ‘Mary’, making listeners feel almost guilty for intruding on such personal subject matter. Tense strings and faint percussion alongside Obel’s delicate vocals mean the sound of glass is again never far away on either song. For an artist who has spoken previously about a need for privacy, it is perhaps no wonder that the topic of subjectivity chimed with Obel. Recording, editing and producing for the most part alone at her home studio, Obel keeps her tracks closely guarded. Her instrumentals always seem to provide Obel with a sort of invisibility-cloak; she is less on show (something she hates) and can hide, albeit briefly, behind the instruments. These instrumentals come on the album in the form of ‘Red Virgin Soil’ and ‘Grasshopper’. It’s here where the most freedom and joy can perhaps be found on Citizen of Glass. Jazz-like, Obel experiments with a wide range of new instruments including a vintage celesta, a rote and a rare 1920’s trautonium in a break away from the control and routine she often favours. The instrumentals seem less tightly planned somehow, suggesting that in life as in music, perhaps the greatest freedom is found when we let go of our subjectivity, indeed becoming invisible for a time. On tracks such as ‘Familiar’ and ‘Golden Green’, Obel pushes the idea further, distorting vocals to the point where she is unrecognisable vocally. Citizen of Glass forces us to reflect on our fragility and transparency as subjects, both individually and collectively. It dares us to explore what being a glass citizen does to us emotionally and creatively, whilst also offering us a means of escape through songs where there are spaces for our subjectivity to disappear, at least for a while. Through Obel’s breathtaking vocals and ethereal piano and cello compositions, Citizen of Glass succeeds in creating a welcome musical space to escape the observations of ourselves and others.